GENERALISATIONS in life are, in my experience, to be avoided. Even that one. They tend to be the broad brush that covers the detail of individuality. So when the commentators, for example, cry on Diana's death that "we are all guilty", I reply quietly: "Not me, Bubba." Similarly, I wonder when the theory is propounded, as it is in Orizio's preface, that we are all capable of being dictators. There is nothing in the physical or emotional make-up that differentiates the dictator from the dictated. We are all flesh and blood. We all suffer fear, experience joy, or harbour grudges. But through self-control, wisdom or perhaps grace, the forces that would drive us to impose ourselves violently on another's life are held in check. For most of us. The dictator is the ultimate in ego, the last, bloody word in the vaunting of self. Orizio has spoken to seven of them, or rather five and two wives. They are Idi Amin, formerly of Uganda, Jean Bedel-Bokassa once of the Central African Republic, General Wojciech Jaruzelski, once president of Poland, Nexhmije Hoxha, wife of Enver, tyrant of Albania, Baby Doc Duvalier, formerly of Haiti, Colonel Mengistu Haile Mariam, once of Ethiopia, and Mira Markovic, better known as Mrs Milosovic of Serbian infamy. Orizio's purpose was to find how these dictators operated and to see if they offered any lessons for a greater understanding of ourselves. The first is an exercise in the impossible. The second is a resounding triumph in a remarkable book. Orizio, London correspondent for La Repubblica, must be initially congratulated on his persistence, bravery and ingenuity in arranging the interviews. Every meeting, too, is a first-class piece of reportage. The deeds of the dictators are laid out gently before the reader almost without comment, like a cat placing a mouse before an owner. This is what these people do, Orizio seems to be insisting. 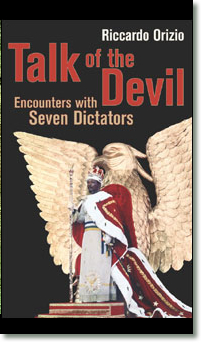 There are tales of the cannibalism of Bokassa and Amin. There is the portrait of the Mengistu swimming pool carpeted in human bone. And did he really kill Haile Selassie with his bare hands? There is Jaruzelski opening the door on the fall of communism, Mrs Milosovic protesting her husband's innocence while packing her bag to visit him in a cell at The Hague. But amid the violence, the protestations, the persistent whine of dictators betrayed, nothing stands out so much as self- aggrandisement and self-obsession. Witness the prayer that Papa Doc insisted should be adopted by all his subjects: "Our Pap Doc, who art in the National Palace for life, hallowed be thy name by present and future generations..." It continues in predictable vein. It is a grandiose statement of what marks out the dictator. Orizio states: "I deliberately chose those who had fallen from their power in disgrace, because those who fall on their feet tend not to examine their own conscience." In this, if in so little else, he was mistaken. The seven interviews are linked with one unbreakable strand. These dictators believe they were never wrong. There is no remorseful introspection. Indeed, they believe that events since their demises have proved them right. Jaruzelski produces memo after memo, Mrs Milosovic is insolently defiant, Amin, Bokassa and the others blame conspirators, laugh off accusations of extreme cruelty and declare not just their innocence but their right, their duty to perform deeds that laid waste to lives. There is no repentance, spiritual or moral. There is only defiance and burning resentment. These are men and women who nurse their wrath to keep it warm. Their conscience lies cold and unobserved. They rake over the coals of past injustices committed against them yet airily dismiss the vicious injustices they inflicted on others. There is something almost splendidly heroic in the denial of Mrs Hoxha. She tells Orizio who visits her in prison: "Write about the way I am treated by the politicians of this democracy." She will shoulder no blame. Has she any regrets about torturing and murdering her opponents? "No. No," she replies, "because a state has to defend itself from those who plot against it." There is something frightening in the insulation of Amin from the horrors he instigated. No fewer than 300,000 people died under his reign. Like some deranged Roman emperor, aides disappeared only to be found decapitated. His court was marked by fear and ran with the blood of his opponents. He took a thriving nation and turned it into an economic and moral wasteland. Tracked down to Saudi Arabia, he is asked by Orizio: "Do you feel any remorse?" "No. Only nostalgia," replies Amin. This, then, is the constant refrain, broken only by a chorus of blaming the West for the troubles of Africa, of Poland, of a disintegrating Yugoslavia. But if the self-justification rings false, there is an uncomfortable point in the fingers of accusation towards the West. Mrs Milosovic points out that the West, to pursue its own ends, supported Kosovo where, incidentally, Osama bin Laden had a base of operations. Amin was once welcomed by our own, dear Queen. Mengistu was held up as an example of enlightened African socialism. Bokassa was a friend of France until he proved too much of an embarrassment. 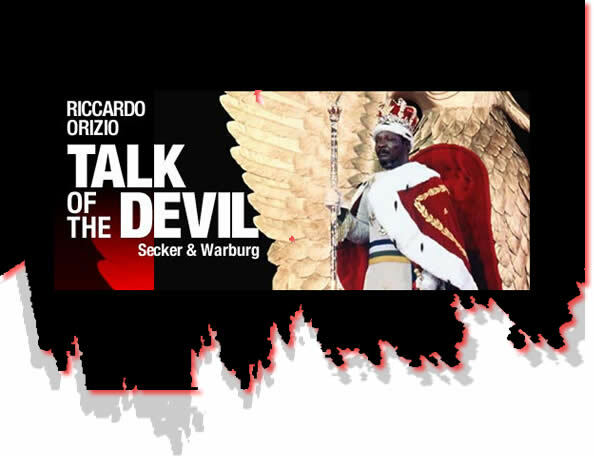 While Orizio invites us to look on the horror of dictatorship, he does not allow us to luxuriate in the sentiment that this only happens in the dark corners of backward Africa or in corridors of unenlightened Europe. State-sanctioned murder is not exclusive to African republics, the Balkans, or a crumbling Communist state. In a book which poses uncomfortable questions, it is Bokassa, the scourge of the Central African Republic, who provides the most uncomfortable tirade. He does not deny murder, but fulminates: "But I was not the only one. What about Ariel Sharon? Why has he been forgiven for the massacres at Shabra and Shatila, while I have been forgiven for nothing? Just because I am African?"